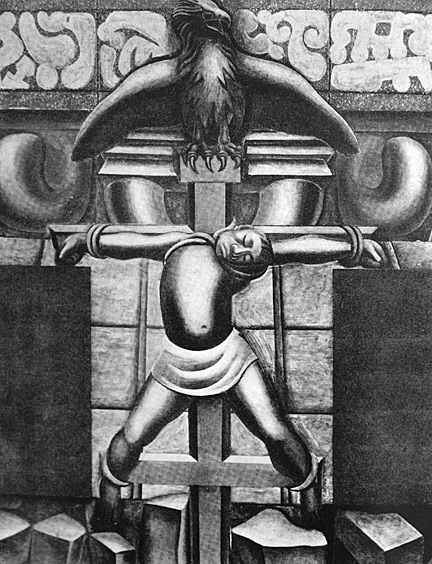 Black & white detail from the 1932 América Tropical mural by Siqueiros. "City fathers immediately censored the artwork because of its anti-imperialist sentiments". I am thrilled to announce the October 9, 2012 public unveiling of David Alfaro Siqueiros’ fully preserved 1932 mural América Tropical, at the site of the mural’s original location, a rooftop wall at the Italian Hall located on Los Angeles’ historic Olvera Street. Concurrent with the unveiling of the mural will be the official public opening of Olvera Street’s América Tropical Interpretive Center. October 9th will be a momentous occasion for the arts community and the people of L.A., as well as a significant event for people around the world… since it represents a victory for artistic freedom over the forces of reaction and censorship. If any one person can be credited for bringing about the preservation of América Tropical, it would be the art historian Shifra M. Goldman (1926-2011), who almost single-handedly waged a campaign to save the Siqueiros mural starting in 1968. She even approached Siqueiros in 1972 with a proposal to recreate a modified version of the mural, a plan the artist agreed to but never completed due to his death in 1974 at the age of 78. Certainly the Getty Conservation Institute (GCI) and all of its dedicated staff must be applauded for their massive efforts in saving and preserving the mural. I believe the preservation of the Siqueiros mural represents one of the GCI’s finest hours, and their keen efforts will add to the deep and meaningful history of Los Angeles. There are many others too numerous to credit by name for helping to bring América Tropical back to life, but the most important factor behind the renovation of the mural is the countless numbers of people who refused to forget the mural and its destruction by a coat of whitewash ordered by city authorities in 1932. As a child my parents took me to Olvera Street on numerous occasions in the late 1950s, where my mother told me the story of the whitewashed mural. It was a tale I did not fully understand until the late 1960s, when Chicano movement activists began to rediscover the works of Siqueiros and other Mexican social realist artists, pointing to L.A.’s América Tropical as a symbol of what Chicanarte (Chicano art) could achieve… if only the will could be found. One can easily say that L.A.’s much heralded mural movement actually started when David Alfaro Siqueiros painted his contentious Olvera Street mural. I must add that the Los Angeles based organization, Amigos de Siqueiros (Friends of Siqueiros), has played a crucial role in the mural preservation project. I was inducted into the group, and now proudly sit on its Board of Directors. Amigos de Siqueiros has as its mission, the protection, conservation, and promotion of América Tropical and the long-term stewardship of the mural, as well as to advance the legacy of Siqueiros. 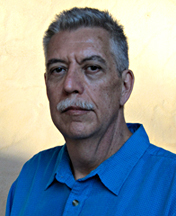 In my capacity as a member of the Board of Directors of Amigos de Siqueiros, I invite people everywhere to come to Olvera Street on October 9, 2012, to join in the historic unveiling and celebration. In 2002 I attended the public unveiling ceremony the Santa Barbara Museum of Art held for its Siqueiros mural, Retrato del Mexico de hoy: 1932 (Portrait of Mexico Today: 1932), thousands attended the event. The América Tropical unveiling will no doubt attract as large, if not a greater crowd of enthusiastic art lovers. The Getty Conservation Institute has published press releases in English and Spanish, announcing the Oct. 9th unveiling, as well as a number of other public events coordinated with Amigos de Siqueiros; from movie screenings and speakers forums to symposiums and a tour of Eastside Los Angeles murals. The entire schedule of events are listed in the GCI press releases. The village that became the modern City of Los Angeles now has a new wrinkle in its complex history. El Pueblo de Nuestra Señora la Reina de los Ángeles (The Town of Our Lady Queen of the Angels), was the settlement founded in 1781 by Spanish colonizers; it became the largest city of Mexico’s Alta California after Mexico won its independence from Spain. The municipality was seized by Americans when they invaded Mexico during the American war on Mexico (1846-48), taking 55% of Mexico’s territory under the spurious postwar “Treaty of Guadalupe Hidalgo“. In the late 20th century Mexican artist David Alfaro Siqueiros painted his América Tropical on a wall in El Pueblo; city fathers immediately censored the artwork because of its anti-imperialist sentiments. In early 21st century Los Angeles the mural returns as a ghost image to remind us all of the folly and transient nature of empire. América Tropical is not just a faded mural brought back to life, it is a distillation of experiences lived on both sides of the U.S./ Mexico border. It is a collaboration between a master Mexican artist and his “Bloc of Painters” - those 29 U.S. artists that helped paint the Olvera Street mural; the mural is a fusion of cultures and histories, and a sign-post for the way forward in art. It is a consummate example of social realism, that socially engaged school of art that flourished in the U.S., Mexico, and Europe during the years of the Great Depression. Siqueiros and his associates confronted the world crisis of their day through their art, and now artists once again face a global crisis of unparalleled dimension. Perhaps the rebirth of América Tropical will help spark a resurgent social realism for the 21st century… that just might be the real legacy of Siqueiros. The public unveiling of América Tropical and the opening of the América Tropical Interpretive Center will occur at noon on Tuesday, October 9, 2012. The ceremony takes place at El Pueblo de Los Angeles Historical Monument, Sepulveda House, 125 Paseo de la Plaza, in downtown L.A.